Jury says CSUF discriminated against Stacy Johnson-Klein. A jury Thursday awarded $19.1 million to former Fresno State women’s basketball coach Stacy Johnson-Klein in a verdict that was stunning as much for its speed as its size. After eight weeks of testimony in Johnson-Klein’s sexual discrimination trial, the jury of 11 women and one man needed less than four hours of deliberations to unanimously decide the university had discriminated and retaliated against her. The jurors embraced her lawyers’ explanation for her firing nearly three years ago: She’s a woman, she was an unrelenting champion of women’s equality and Fresno State couldn’t tolerate such an employee. Fresno State President John Welty said in a statement: “This fundamentally has always been an employment case. The university will always act when the health and welfare of its students is endangered. In his Fulton Mall office an hour after the verdict, Fresno State lawyer Mick Marderosian said he was upset with the verdict. “I’m embarrassed for my community and for my hometown,” Marderosian said. Thursday’s verdict was the third time in five months that the central San Joaquin Valley’s largest institution of higher learning suffered an expensive and high-profile blow to its reputation for gender equity. In July, former volleyball coach Lindy Vivas’ sexual discrimination trial ended in a $5.85 million verdict, later reduced to $4.52 million. And in October, the university settled the sexual discrimination lawsuit of former associate athletic director Diane Milutinovich for $3.5 million. Johnson-Klein lawyer Warren Paboojian said Johnson-Klein several weeks before the trial offered to settle her case for $950,000, but the university’s top offer was $550,000. As eye-opening as the Vivas judgment and Milutinovich settlement were, neither came close to matching the jaw-dropping shock of Thursday’s verdict. The jury was charged with answering yes or no to nine questions, ranging from whether Johnson-Klein was a victim of gender discrimination to whether she was sexually harassed because she’s a woman. In the hushed courtroom of Judge Donald S. Black, the court clerk read the jury’s decision: Yes. Johnson-Klein responded with a barely perceptible cry after each affirmative answer. Then the court clerk read the damages. 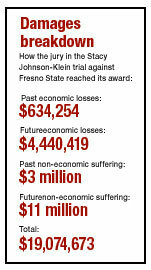 Economic losses from Johnson-Klein’s firing on March 2, 2005, to the trial’s start: $634,254. Future economic losses if she hadn’t been fired: $4,440,419. Noneconomic suffering from the date of the firing to the trial’s start: $3 million. Noneconomic suffering Johnson-Klein will suffer for the rest of her life: $11 million. A bailiff had warned spectators against making any sound when the verdict was read, but the size of these figures overwhelmed the reticence of many Johnson-Klein supporters. Their gasps and the creaking of benches as they shook a neighbor’s hand or patted a loved one’s back drifted across the courtroom. The court clerk then polled each juror on all nine legal questions and each individual award of damages. The result was 156 yes votes and not a single no. Fresno State lawyers Marderosian and Dawn Theodora and university vice president for administration Cynthia Teniente-Matson sat expressionless. To their right, Johnson-Klein wiped away tears with a tissue. In the hall after the verdict, Johnson-Klein said she couldn’t believe what she was hearing from the court clerk. “I started thanking God. I started thanking my savior,” Johnson-Klein said. It was fitting that the verdict should be the biggest surprise in a trial full of them. It was only late Wednesday afternoon that the jury received the case after a day filled with closing arguments and instructions from Black. Jurors didn’t begin deliberations until 9 a.m. Thursday, then broke for lunch shortly before noon and returned an hour later. Shortly before 2 p.m., court officials announced a verdict had been reached. Johnson-Klein lawyers Paboojian and Dan Siegel, who have more than a half-century of legal experience between them, said their hearts dropped when they got the call. Siegel said conventional courthouse wisdom is a quick verdict bodes well for the defense. The Johnson-Klein team entered the courtroom as if going to a funeral. Johnson-Klein sat at the plaintiff’s table with a stricken expression. A scowling Siegel swiveled several times in his chair to disgustedly shake his head at Chuck Klein, Johnson-Klein’s husband. Minutes later, there was only joy. Fresno State had portrayed Johnson-Klein as a cruel manipulator who had abused her charge as a teacher. The prime example of her unacceptable behavior, the university said, was the October day in 2004 when Johnson-Klein took a half-bottle of prescription painkillers from a player. Johnson-Klein countered that Fresno State had a long history of treating women in the athletic department as second-class citizens. She said she put up with sexual harassment from her superiors because she didn’t want to lose her job, but drew the line when the university refused to treat her program as it did the men’s basketball team. When she talked about filing a complaint with the federal government, Johnson-Klein said, the university concocted a biased investigative report into her alleged transgressions and used it as justification to fire her. The jury Thursday said history must record Johnson-Klein’s version of events as the truth. Johnson-Klein was an immensely popular coach at Fresno State, filling the tiny North Gym with fans during her first season as coach in 2002-2003 and consistently drawing good crowds to games at the new Save Mart Center in the next season-and-a-half. She remained a source of admiration Thursday. “Thank you, Stacy,” supporters yelled as she walked from the courtroom to speak with the media. Fresno State’s appeal of the Vivas verdict continues to work its way through the legal system, and Johnson-Klein said she expects more of the same with her judgment. Milutinovich said she hoped the Cal State University system makes changes in light of Fresno State losing two cases and settling a third in five months. “I hope the days of discriminatory treatment of women athletes, coaches and staff members are over with today’s verdict,” Milutinovich said. Two former Johnson-Klein players who testified for Fresno State were in tears as they exited the courthouse. “We know how we were treated and how the other coaches were treated, and it was upsetting to see that none of that seemed to matter,” Walker-Roche said. “I don’t know how she can claim to care about us and allow that to happen. On the Fresno State campus, students and teachers were shocked more by the amount of the judgment than the verdict. Guy Decatrel, a marketing instructor at Fresno State, said discussing the topic on campus is taboo. “No one really spoke about the case, but I know everyone wanted to know the outcome,” Decatrel said. A key theme throughout the trial was Johnson-Klein’s love for basketball. She and her mother made their own basketball court out of rocks when she was a little girl in Oklahoma, and she grew up to be a high-scoring star in high school and college. Now 37, Johnson-Klein admits her direct influence on the college basketball industry is probably at an end.